After all outstanding House races are settled, the Congressional Progressive Caucus will increase its membership from 78 to around 95 members next year — about 40 percent of the entire Democratic Caucus. Progressive Caucus leaders are using that leverage to secure influential House committee assignments. “Thursday’s meeting with Pelosi included Jayapal and current Progressive Caucus Co-Chair Mark Pocan (D-WI). 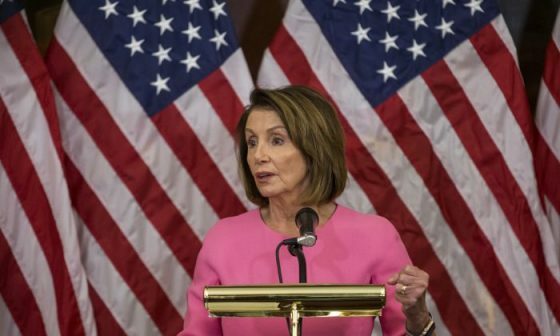 One request to which Pelosi agreed was to give the Progressive Caucus proportional representation on what lawmakers call the ‘A committees’: the Appropriations, Ways and Means, Energy and Commerce, Financial Services and Intelligence committees,” the Politico article continued. The upcoming 116th Congress will bring the Progressive Caucus to the peak of its power, simultaneously increasing the influence of its allies in the US communist and socialist movements. This development must be gratifying for Sanders. As a freshman himself, he founded the caucus in 1991 with DSA member Congressman Ron Dellums(D-CA) and DSA/CPUSA-friendly Maxine Waters (D-CA). The DSA–Progressive Caucus relationship remains strong and high level. The 116th Congress will include at least three “former” DSA members: Jerry Nadler (D-NY), Jan Schakowsky (D-IL), Danny Davis (D-IL), and two new comrades Alexandria Ocasio-Cortez (D-NY) and Rashida Tlaib (D-MI). At least a dozen more can be considered as moving in the DSA “orbit” including Jamie Raskin (D-MD), Lloyd Doggett (D-TX), Dave Loebsack (D-IA) and Progressive Caucus Co-chair Mark Pocan (D-WI). Progressive Caucus leaders Raul Grijalva and Keith Ellison both have long histories with the CPUSA, along with many other prominent Caucus members including Rosa DeLauro (D-CN), Eddie Bernice Johnson (D-TX), Barbara Lee (D-CA), Bennie Thompson (D-MS), and Gwen Moore (D-WI). Former caucus activist Nancy Pelosi herself was very tight with some CPUSA personalities at the beginning of her political career in San Francisco. Virtually every major plank of today’s Democratic Party — from single-payer healthcare, amnesty for illegal aliens, normalization of relations with communist Cuba, $15 per hour minimum wage, and others—originated with the CPUSA or DSA — or from their foreign masters. It is not the slightest exaggeration to say that the communists and socialists drive Democratic Party policy formation. With nearly 100 members — including a fresh cohort of ultra-radical recruits — coupled with the unprecedented potential to influence legislative priorities thanks to Pelosi, the caucus is positioning itself to assert extraordinary power.